Superconductors.ORG herein reports the discovery of room-temperature superconductors number 28, 29 and 30. These three materials all feature the F212C copper-chain structure shown below left. 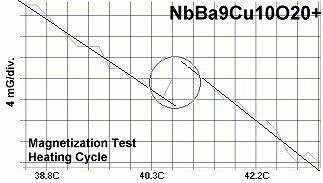 However, unlike the Zr19A prototype announced in July 2015, they all have a Group 5b metal in the anion (the "Light" region of the structure). 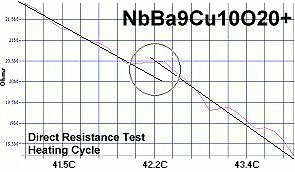 5b metals typically have a +5 preferred oxidation state. These discoveries expand the universe of elements from which room-temperature copper-oxide superconductors can be synthesized. While the best performing materials were previously limited to having an anion with a +4 oxidation state, +5 now appears equally viable. These discoveries also make it possible to quantify the influence of planar weight ratio (PWR) directly with dielectric constant (K). Since tantalum and niobium have similar chemical properties and transition temperatures, it can be deduced that a 2-to-1 PWR increase will produce the same Tc improvement as a 10-to-1 Kappa increase. 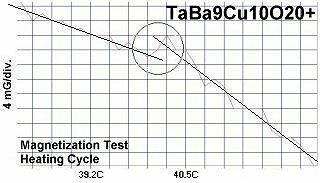 This is because the weight disadvantage of using tantalum is completely offset by the higher Kappa of Ta-Cu-O versus Nb-O. 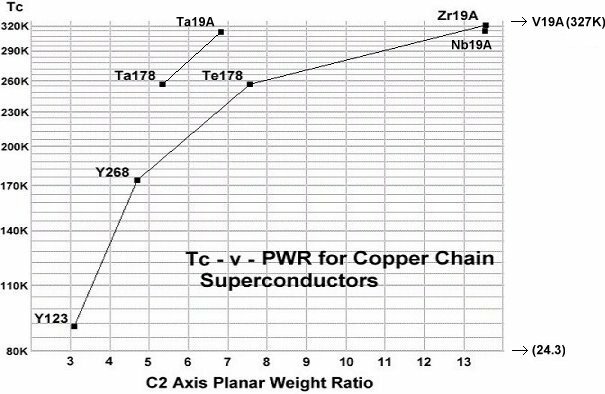 The below graph illustrates the correlation between PWR and Tc, as well as confirms the strong influence that dielectric constant has in promoting Tc. 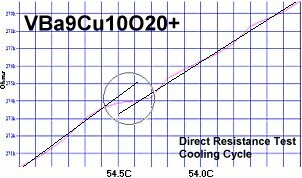 A tantalum-copper-oxide anion will produce a much higher transition temperature at the same PWR. In order to maximize formation of the F212C structure, These compounds were synthesized using the layer cake method, as shown below. The pellet had approximately 100 interference layers. And, even using this layering technique, the volume fraction is low, requiring very sensitive test equipment. ...and the below for the EVEN layers. The chemical precursors were pelletized at 60,000 PSI and calcined for various periods3 and then sintered for 9 hours at 880C. Lastly the pellet was annealed for 10+ hours at 500C in flowing O2. 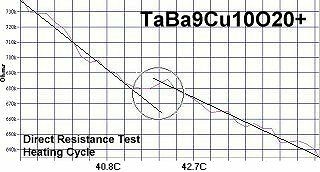 Temperature was determined using an Omega type "T" thermocouple and precision OP77 DC amplifier. The magnetometer employed twin Honeywell SS94A1F Hall-effect sensors with a tandem sensitivity of 50 mv/Gauss. FOR A LIST of all 30 room-temperature superconductors, click HERE. 1. 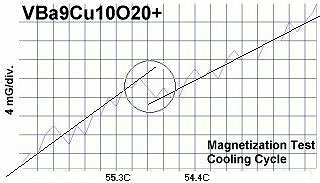 Testing temperatures are believed accurate within ± 0.5 degrees C.
was deemed to be the stoichiometric phase. 3. Calcination temperatures and durations can be provided upon request.